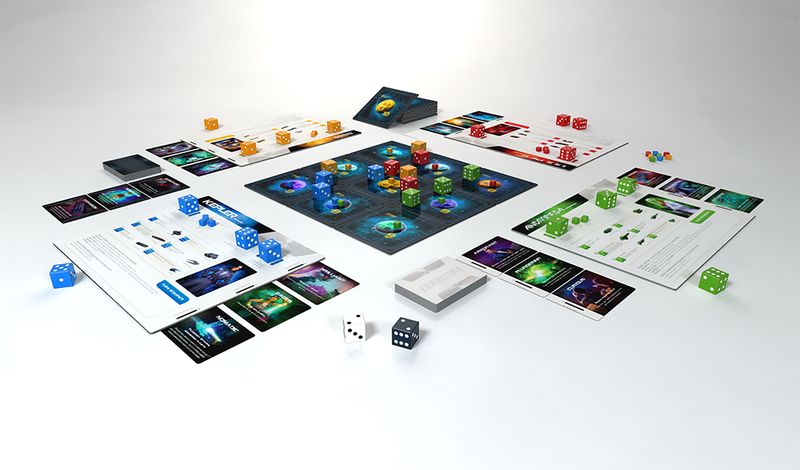 Quantum is a light, space-themed game. 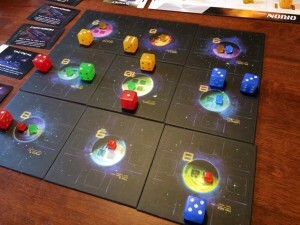 Players have ships which are represented by dice that travel between the planets trying to colonise them (place cubes on them). The first player to place all their cubes wins. The ships (dice) are rolled to determine what type of ship they are – a low number means they are slow moving but powerful in combat, and vice versa. (In fact, the dice value is how many spaces they can move which makes things simple.) Each type of ship has a special power too, such as transporting another ship, swapping places, changing a ship’s value and this makes each quite different. As promised, this year’s 5th Annual Game Giveaway is a competition where you could win a copy of Funforge’s new game Quantum and it has now started! See the competition page for details. Competition ends at 5.00pm on Monday 28th October (UK time). 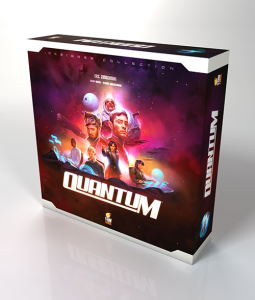 I am very pleased to announce that this year’s Metagames’ Annual Spiel game giveaway is being supported by Funforge and I will be running a competition for one of you to win a copy of Funforge’s promising new game Quantum. More details of the competition will be coming in the next week so stay tuned. The competition this year will revolve around the games I have previewed for this year’s Spiel. I always have time for Funforge’s games as they’re always really nicely produced. This year, they are releasing a light, space-themed game called Quantum. Players have dice (which are ships) that travel between the planets trying to colonise them (place cubes on them). The first player to place all their cubes wins. The ships (dice) are rolled to determine what type of ship they are – a low number means they can not move far but are powerful in combat, and vice versa. In fact, the dice number is how many spaces they can move. However, each type of ship has a special power too, such as transporting another ship, swapping places, changing a ship’s value.